The adventures of DC's greatest heroes continues in tales from Superman/Batman #64-75 and Superman/Batman Annual #4. 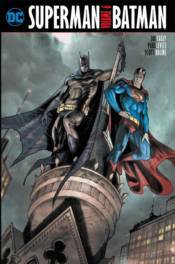 Batman and Superman investigate a Kryptonian ship floating in space, and Scarecrow subjects Superman, Batman, the Joker and Lex Luthor to his fear gas. Plus, appearances by Man-Bat, Solomon Grundy and Lois Lane, and a trip to the Fortress of Solitude.